Mine hoisting is the most critical and potentially the most dangerous operation in underground mining. Many hazards are related to falls of miners and materials, ground instability, and malfunction or lack of safety devices. All have the potential to cause a catastrophic accident. A condition know as 'slack rope' is particularly dangerous, especially if it occurs without the operator's awareness. The most common occurrence of slack rope is in metal or nonmetal mines that have a history of ground control problems near the shaft. 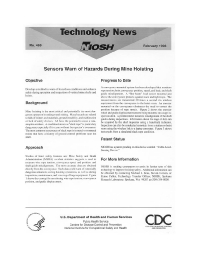 Studies of hoist safety features and Mine Safety and Health Administration (MSHA) accident statistics suggests a need to measure wire rope tension, conveyance speed and position, and shaft guide misalignment. The most accurate data are obtained directly from the conveyance. Such data could warn of potentially dangerous situations during hoisting operations, as well as during inspections, maintenance, and lowering of large equipment. Figure 1 shows the concept of monitoring wire rope tension, conveyance speed and position, and shaft guide misalignment. L The most accurate data are obtained directly from the conveyance. Such data could warn of potentially dangerous situations during hoisting operations, as well as during inspections, maintenance, and lowering of large equipment. Figure 1 shows the concept for monitoring wire rope tension, conveyance position, and guide displacement.